As approximately two wees has passed since the American-British-French military strike on Syria, SNHR has released a report documenting that 64 civilians, including 12 children, were killed at the hands of Syrian-Russian alliance forces. The report notes that The Syrian regime carried out two chemical attacks on Douma city, Damascus suburbs governorate on April 7. The second of those attacks was the bloodiest since Khan Sheikhoun attack last year, as 41 civilians, including 12 children and 14 women, were killed in Douma while about 550 others were injured. Consequently, the Security Council held an emergency meeting on April 10 where the US proposed a draft resolution to form an investigation committee on the use of chemical weapons. However, Russia vetoed the draft resolution, which was the 12th veto Russia has used on Syria since the start of the popular uprising, and the sixth with regard to chemical weapons, despite the fact that Russia has repeatedly denied the occurrence of the attack at times, while accusing the armed opposition of being responsible for it on other occasions. 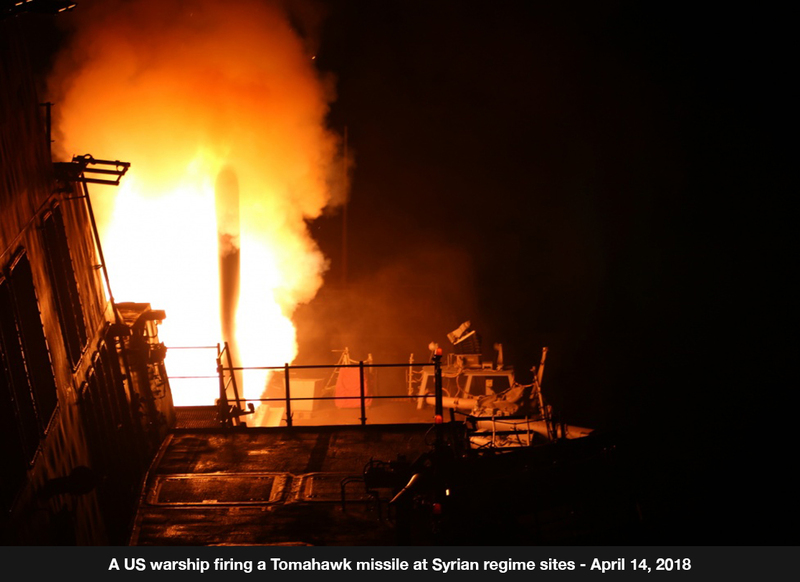 The report records a notable drop in the rates of killing and bombing by the Syrian-Russian alliance in the wake of the military strike despite being extremely limited. These very same limitations have encouraged the Syrian regime and its allies to gradually return to bombing, killing, and absolutely refusing any political solution. The report stresses that tens of violations by Syrian-Russian alliance forces have been recorded, especially in northern suburbs of Homs, southern suburbs of Hama, and southern Damascus city. According to the report, large segments of the Syrian people, who has suffered heavy, concentrated bombing on its populated areas for seven years during which hundreds of thousands of Syrians were killed, were hopeful that these strikes will target airbases and warplanes that drop barrel bomb and fire directed missiles, as only then will there be a tangible end for the killing and the Syrian regime and its allies will feel incapable of demolishing the Syrian society which will force them to seek a political settlement. The report adds that there are prevalent fears that this military strike will be similar to the strike on al Shayrat Airbase last year with no deterring political or military action to follow, which enticed the Syrian regime to use chemical weapons again and continue to perpetrate all kinds of violations. On a related note, the report stresses that SNHR team recorded 13 uses of chemical weapons by the Syrian regime between the first and second military strike. The report outlines the most notable violations by the Syrian-Russian alliance, including killings, attacks on vital civilian facilities, and the use of incendiary ammunitions and barrel bombs, in the wake of the American-British-French strike between April 14, 2018 and April 28, 2018. The report draws upon the ongoing monitoring for incidents and developments by SNHR team through am extensive network of relations with tens of various sources, in addition to speaking to survivors and victims’ relatives and analyzing pictures and videos. The report documents that Syrian-Russian alliance forces killed 64 civilians, including 12 children and eight women (adult female). Of those, 62 were killed by Syrian regime forces, while two were killed by Russian forces. Also, the report records that two massacres were perpetrated by Syrian regime forces in Homs and Damascus suburbs governorate. The report records nine attacks on vital civilian facilities – eight by Syrian regime forces and one by Russian forces. According to the report, Syrian-Russian alliance forces used incendiary ammunitions in three attacks, while government helicopters dropped no less than 522 barrel bombs, most of which were dropped on Damascus suburbs governorate. The report stresses that the Syrian regime has, through the use of chemical weapons in Douma city, violated the customary international humanitarian law and the CWC, as well as all relevant Security Council Resolution – particularly 2118, 2209, and 2235. Moreover, the use of chemical weapons constitutes a war crime according to the International Criminal Court Rome Statue. The report also adds that the CWC, which the Russian government has ratified, explicitly prohibits any assistance or encouragement on contribution to any prohibited activity by a state party. However, a number of evidences have suggested that Russian forces have provided support for Syrian regime forces before and after their attacks. According to the report, the Russian-Syrian alliance has, beyond any doubt, violated Security Council Resolution 2139 and 2254 which states that indiscriminate attacks should be ceased. Also, they’ve violated Article 8 of Rome Statue through the crime of willful killing, which constitutes war crimes. The report calls on the Security Council to take practical and additional steps in the wake of the Syrian-Russia-Iranian alliance forces violating all the Resolutions adopted by the Security Council. In addition, the report calls on the four permanent member states to apply pressure on the Russian government to cease its support for the Syrian regime who uses chemical weapons, as its implication in this regard has been proven. Moreover, the report calls for the implementation of the ‘Responsibility to Protect (R2P)’ norm after all political initiatives have been to no avail. Therefore, after all of this, action should be taken under Chapter VII of the Charter of the United Nations and the ‘Responsibility to Protect’ norm, which was established by the UN General Assembly, should be implemented. The Security Council is still hindering the protection of civilians in Syria. The report stresses that he states should demonstrate a better unification in the face of the Syria regime, the primary and main use of chemical weapons in this century, and take serious, joint steps to impose strict, deterrent, real sanctions immediately. Further, the report calls for forming a humanitarian alliance that aims to protect Syrian civilians from chemical weapons and barrel bomb since Russia will continue to hinder the Security Council and use veto countless times. The report emphasizes that action should be taken to deter the Syrian regime from perpetrating all kinds of violations, including killing, and not only the use of chemical weapons. The report calls on the Russian regime to stop using veto in order to protect the Syrian regime who has been involved in perpetrating crimes against humanity and war crimes, and using chemical weapons. Also, the report says that Russian forces should Launch investigations into the support provided by Russian forces in Syria to the Syrian regime in the attack on Douma and the attacks that preceded, and stop hindering the referral the case in Syrian to the International Criminal Court.